Description: Built by Baldwin in 1943, this massive Northern-type locomotive is taking on water in this photo. Specifics - class 2900, 80" drivers, 300 psi boiler pressure, 28"x32" cylinders, engine weight of 510,150 lb, tractive effort of 79,968 lb. The class was retired in 1959. Unknown photographer. Acutal date and location are unknown. Thanks to Radford Walker (see comment below), this may have been taken in Rice Yard in Denver, Colorado. Description: Santa Fe 2903 sits in the late afternoon sun after a herculean effort to move it from its one time home at the Museum of Science & Industry. It is the largest preserved locomotive in Illinois. This image was purchased from the Illinois Railway Museum’s Used Book Store. Description: 4-8-4 Northern steam locomotive built in 1943 by the Baldwin Locomotive Works. Description: 80 inch drivers and roller bearings...the ATSF's 2900's were/are huge. 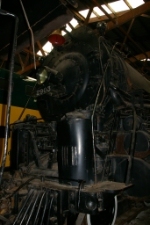 Description: With the Diesels out, there was an oppertunity to photograph some of the larger steam in barn 9. Description: The big 2900-class was out of Barn 9 for display during the Santa Fe Sign Lighting Ceremony which took place the night before this image was captured.. Description: Outside for the Weekend. Description: Here is the 1982 sign from the Railway Exchange Building on Michigan Avenue in downtown Chicago. Description: This car, with a capacity of 7,000 gallons of oil and 24,500 gallons of water, it rides on unique Buckeye four axle trucks. Description: View of the engineer's side.